Children usually say their first words between nine and 18 months old. The most common first words are either “mama” or “dada’. What’s kind of interesting is no matter what language children are raised in, the first words usually reference either mother or father. By the age of 18 months a child usually has a vocabulary of 50 to 150 words. By two they can probably use over 300 words and understand about 1,000 words. By about 18 months children begin to put a couple of words together to form a sentence sometimes referred to as “telegraphic speech” such as “Mommy ball” or “Mommy throw ball”. Around 3 years of age, children begin to use language for all kinds of things. They are not only trying to get things by asking they are talking about past experiences and even beginning to use it to pretend. By preschool (4 ½) they are beginning to understand and use the rules of language to express possession of something, connect thoughts and quantify. There language is becoming more like that of adults. In elementary school children continue to expand their use of oral language but are also learning to read a write. As children progress through middle school and high school they continue to expand their vocabulary and refining their grammatical skills and write in more complexities as well as continue to develop reading comprehension skills. The tables below describe specific skill development for each stage of development through age 8. 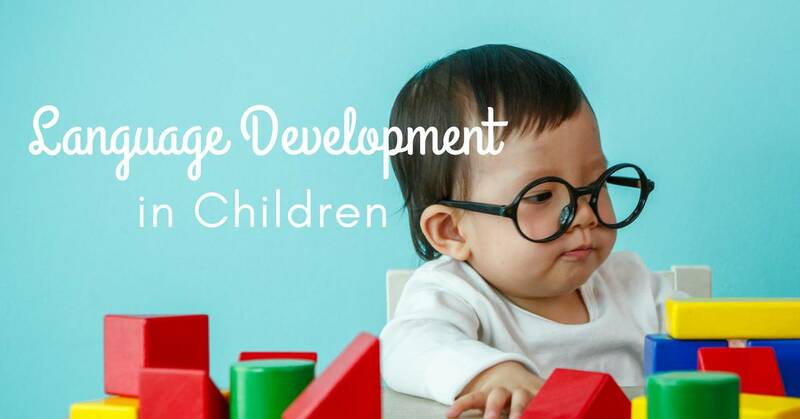 Below the developmental time line you will find information on how you can stimulate and encourage language development as well as information on how to recognize lagging development and what to do about it. Check out the time lines and look for delays. Remember that there is quite a range of time for the achievement of each milestone. If you feel there is a delay, discuss it with your child’s primary care physician. Look for poor eye contact and lack of attention and focus. Listen to how they pronounce words. Are they hard to understand? Can they understand simple directions? Are they having trouble with basic social skills? Does your child not seem to be interested in having you read to them? Do they repeat what you say or say the same thing over and over? Do they lack empathy for the feelings of others? Are they only interested in talking or reading about one subject? Is your preschooler not engaging in fantasy play? Do they lack a sense of humor? Beyond Baby Talk: From Speaking to Spelling: A Guide to Language and Literacy Development for Parents and Caregivers Language is about so much more than just words, and healthy communication is the foundation of your child’s ability to succeed emotionally, socially, and academically. The first eight years of life are a critical period of language and literacy development, and as a parent, you are your child’s primary role model as he or she begins to acquire speaking, reading, and writing skills. And yet, you may be uncertain of what constitutes typical language progress and of what activities and practices will enhance your child’s learning experiences the most. Fully revised and updated for our modern times, Beyond Baby Talk is here to guide you through the easiest and most engaging ways to instill strong communication skills in your child, and to provide fun for you both along the way. 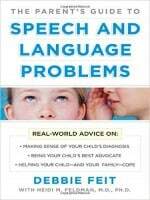 The Parent’s Guide to Speech and Language Problems Your definitive guide for helping your speech-impaired child–cowritten by two in-the-trenches experts. When a child has communication problems– diagnosed or not–parents are first looking for a place to go for help. The Parent’s Guide to Speech and Language Problems is a one-stop resource, offering not just the most up-to-date medical information but also advice and encouragement from a mom who’s been there. Author Debbie Feit has two children with speech problems and knows what it takes to survive and thrive day-to-day as a family. No other book on the market can match this one for its combination of clinical research and real-world, hands-on parenting solutions.